Blog - History In Your Hands! Coins are often described as “history in your hands.” When it comes to today’s offer, we couldn’t agree more. Here at Monument Metals, we handle a tremendous amount of 90% silver coins. The vast majority of the material we get in is dated between 1940-1964. However, on rare occasion, we end up with coins from the late 19th and early 20th century. These older 90% coins stand out due to their distinctive design. From 1892-1916, the U.S. Mint used a motif called the “Barber” design on Dimes, Quarters, and Half Dollars. The design is named after its creator, Charles E. Barber, who served as the U.S. Mint Chief Engraver from 1879 through 1917. Low Premium: These coins will exhibit heavy wear, cleaning, scratches, discoloration, or a combination of the above. Since Barber coins are over a century old (!) and were likely exposed to decades of heavy use, they are frequently seen in this condition. Low Premium Barber coins are the most affordable option. Average Circulated: These coins will show extensive wear but will have smooth, problem-free surfaces and much of the original rim intact. You’ll find them to have a very pleasing appearance and solid eye appeal. 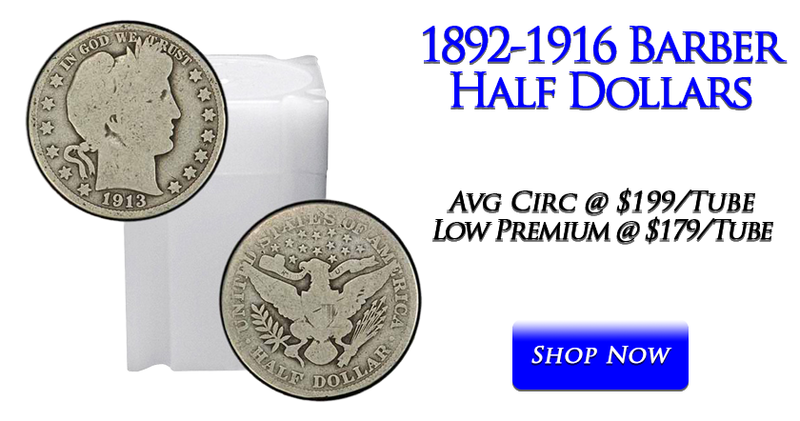 Many dealers throw Low Premium coins into their Average Circulated category, but we reserve the latter grade for nice coins with “honest” wear. Regardless of which grade you pick, we can’t emphasize enough how rare these are. Less than 1% of all 90% silver coins we see are of this Barber design; they simply do not exist in quantity! Today, we’re making an extremely limited quantity of Barber 50c available for purchase at low wholesale rates. Not only are our prices the best of any major dealer for Barber coinage, but you’ll appreciate our careful grading too. Whether you’re a 90% silver specialist – or simply want to add some historic coins to your holdings – we encourage you to pounce on this Barber coinage sale. Quantities are extremely limited and we may not have enough to go around!